Joon’s is an Annex staple– and despite our love for Korean food we have never been. We didn’t get off to a great start– the ambiance isn’t outstanding to begin with (although it’s clean and cheerfully painted, with decent ventilation through large windows to the street) — and our water being served in a beaten-up Rubbermaid plastic bottle, traditional though it may be, didn’t help. There was only one waiter for the whole place, and it took him a good 10 minutes to get around to taking our order. We ordered the Beef Japchae as an appetizer– not bad- medium-greasy, not too sweet, good flavour, and good bulgogi (beef) on top. However, I did get a musty taste off the sesame oil– although I don’t like sesame oil to begin with. We planned on trying the BiBimBap, but decided on the Dak Galbi instead- a dish Joon’s is well known for. 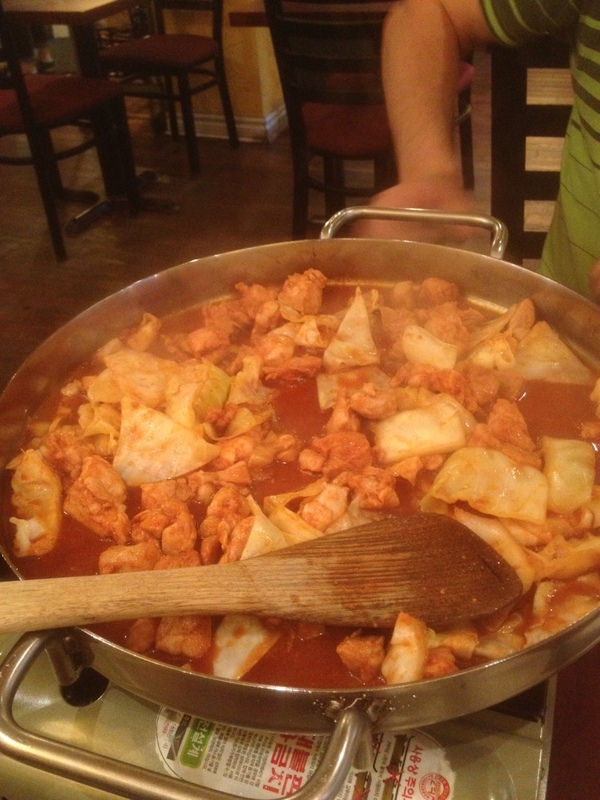 The basic Dak Galbi is dark, boneless chicken meat, cabbage, and gochujang (spicy-sweet hot pepper sauce). You can get add ons such as rice cakes (large, cylindrical rice noodles), mozzarella cheese (sounds weird to me, but lots of people love it), and veggies (e.g. sweet potatoes and green onions). It comes with a minimum of two portions and is cooked in a big pan at your table. It was delicious. The chicken was nice and tender and we love the flavour and texture of gochujang. We ordered two portions of steamed rice (which we learned could be used to add to the pan at the end and make a kind of stirfry). The banchan (side dishes) were nothing special. A salty spout, kimchi (which was pretty good), an interesting jalepeno marinated radish (I think), and a cold mashed potato with veggies that didn’t do anything for me. Although I might try a more “complete” Dak Galbi experience going back, I have to say that BiBimBap is still my favourite– it has the crispy rice, the nice array of veggies, the bulgogi, AND the gochujang. Overall- Joon’s is a keeper! I look forward to trying some of their other menu items. This entry was posted in Dine Under $50, Korean, Recommended, Uncategorized and tagged banchan, bibimbap, bulgogi, dak galbi, gochujang, kalbi. Bookmark the permalink.